The thread about Carl and the Beach Boys in the main section made me think that a thread about Carl would be nice, maybe talking about different releases and aspects of his career. Although there are many good releases, I think it is not always easy to find those CDs. This is an edited show from 1983 that was broadcasted on radio. Carl actually played two (or maybe three?) shows and they are available on bootleg and during one show he even performed an impromptu "Get it" which he recorded with Paul McCartney for the latter's "Tug of war" album. Carl and his band (including his sons Stan on drums and Greg on bass) are in excellent form. From the very first note of "Matchbox" the wholw house is rocking and doesn't stop until the end. "Hi-heel sneakers" was performed often by Carl during these times, but with "Tennesse waltz" and "Got my mojo working" we even have a couple of somewhat rare cuts I believe (although he cut a studio recording of "Got my mojo" in the 80s and there is a live version from the early 90s on youtube). I think "Dixie fried" wasn't performed all that often either. In comparison to his shows at Gilley's (that's for another time) this one has less of a honky tonk feel but that of a New York night club (as I would imagine it) which is probably to be expected as that's what it was. So, if you'd like to have a great introduction to Carl's live shows and an album you can rock out to you should definitely own this. Danke schön, Rocker. You da man! 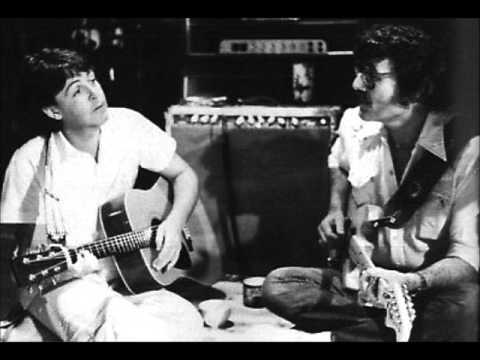 I remember getting Tug of War, and really enjoying "Get it", but I kept reading about another song Carl recorded with McCartney called "My Old Friend". Everytime i'd see a new Carl Perkins album, i'd look for that song, but no luck....until, finally, it appeared on Go Cat Go in 1996. I'd also seen some pics of Carl in the studio with Paul and Denny Laine, jamming on some of the classics. Somewhere i'll bet there is a reel of tape of these 3 guys having fun with some of those great old songs. Probably not likely to be released any time soon, though. Tug of War already got the deluxe treatment, and there was very little in terms of outtakes and rare tracks. These pictures are the only ones I could find right now. I guess they come frome those session, don't they? I heard about rumours that "Get it" was actually co-written by Carl. I am not sure right now if Carl mentions that even on the unedited show at Lone Star Café, I'd have to listen to that again. There are certainly parts that sound like they could come from him in that song, but otherwise there is no need to think McCartney couldn't have written them himself. Also I'd think that Carl would've gotten a credit if he really did substantially write a part of that song. Those 2 pics look familiar; there were a few others in the deluxe reissue of Tug of War. Here are two video I only saw a couple of days ago for the first time. Speaking of Carl's outfits, I think he definitely should've gone with the ones seen in the videos rather than the jumpsuits he wore around that time as well. As seems to have been one of the problems of Carl not being a commercially top artist, the album features a lot of guest artists, including Chet Atkins, Joan Jett and Charlie Daniels. Thankfully their contributions are not vocally but by adding instruments. The production is very early 90s when it comes to synth. horns and the overall way the record sounds. The lead vocals seem to have been mastered with the same heavy reverb throughout every song. During the recording of this album Carl was diagnosed with lung cancer and his vocals seem a little thin on some tracks. The album opener is a strong version of Springsteen‘s Pink Cadillac . Carl‘s vocals are great and I love the „dreck“ he puts into the performance. A couple of songs where written or co-written by his kids and some come from outside sources. Except for „Godfather of Rock&Roll“, which is exactly that kind of nostalgia song that for the most part where a mis-use of his writing skills imo, the strongest contributions come from Carl himself. We get a re-recording of „Birth of Rock&Roll“ which was the lead single for the Class of ´55 album in 1985 and back then even got it´s own music video. Unfortunately I can‘t find it on YouTube so here is a contemporary live performance. This song actually works in contrast to „Godfather...“ but I like the 1985 recording better. The new version features more prominent horns, a somewhat grittier vocal and Chet Atkins. A highlight for me is Carl‘s „Wild Texas wind“ which he re-recorded with Willie Nelson for Perkins‘ last album „Go Cat Go!“ but which also is the title song to a Dolly Parton made-for-TV movie from 1991. She sings a beautiful version in that movie, unfortunately it never was released on record. I updated the wikipedia topic with the info about Carl. The whole movie is on YouTube. Dolly recorded a couple of songs written by Carl like „Silver and gold“ but that‘s for another time. BTW, I came across this review of a british show in '64 (probably the tour when Carl got to know the Beatles). In my opinion, Carl Perkins is the best in the show. No one had really heard of him before he arrived for this tour - which is his first in Britain, but he's winning them over - it's been like that since the show started. The most touching memory I have of this tour took place in Bournemouth. A number of art students who must have spent all their time designing placards threw them on stage for Carl to sign. There were 20 or 30 of them with different placards for his various numbers. The sketches of Carl's face were fantastically lifelike and he was really moved by the tribute. In fact, he was able to keep one of them and is taking it back to America with him, together with a banner which reads 'Welcome Carl (Beatle-basher) Perkins.' He's really proud of that one. Carl showed me one of his inventions - a tremelo arm on the head of his guitar, instead of at the bottom. This enables the player to operate the tremelo with his thumb instead of using the whole hand. Fender are very interested in the idea. When we were at Hammersmith the safety curtain was dropped on Chuck Berry - the audience were crowding onstage, bowing down to him and throwing garlands of flowers. Liverpool Odeon handbill for Chuck Berry, Swinging Blue Jeans, Carl Perkins, Kingsize Taylor and The AnimalsAt one of the parties on the tour we met Jimmy Tarbuck. He's got a fantastic sense of humour. A man was commenting on the green and yellow dress a girl wore. "That's a nice shade," he said. "Let's see your teeth again, love" Jimmy quipped. The Animals have always gone down very well. At some places they've had to work very hard to get an audience - but when they have to, the lead singer Eric, will rip off his shirt, bounce about the stage - and do anything to win them over. Although the lads back Chuck Berry on stage they've never had a rehearsal with him. He came in one day, played half an hour of twelve-bar blues - and that was that. We will all be remaining in Britain, and following this tour we have six weeks of ballroom dates. Two days prior to arriving in England we recorded ten tracks with Franklyn Boyd of Aberbach Music - and a new single is due for release from Decca early next month. There seems to be a bootleg recording of a show from this time. I have never heard it, did any of you? The title seems to be "Carl Lee Perkins -- British Tour 1964 (Doctor Kollector, 1984)"
Here's an amazing song by Carl from 1972, "The Trip". I totally forgot about it, but what a gem! And imo more prove that with the right management he could've made it big in the country and later country rock field. "Cotton top" and "Me without you" were small hits, "Restless" a bigger one. With more promotion I think there was definitely an audience for his new songs. Anyway, enjoy this. It's perfect for such a late-summer day as we have it today in Germany. Unfortunately only a neelde-drop- It's available in great sound on the "Back on top"-boxset. There's an ad on spotify now that uses Restless. I don't know who's doing it, but glad one of Carl's best songs is getting exposure. Oh really? That's cool! I didn't know that? Is it available to watch without having spotify? I have no idea. I don't have spotify on all that often; may try to find it on youtube. Can't find it. But it's cool to know that Carl's music gets recognition. Ok, I have a question for you guys, maybe someone can help me. I need this for a new section on Carl's wikipedia page that I want to make - more of this later. Johnny Cash and June Carter recorded an album called "Carryin' on" in the late 60s. On that album is the song "Long legged guitar pickin' man", that sounds like a Perkins tune, was introduced by Cash on stage more than once as a song written by Carl. But.... on the record it's credited to Marshall Grant. Does anyone know the story behind this? Without wanting to take anything away from Grant, I'm pretty sure it is a Perkins song, it just sounds too much like that. I never knew Marshall Grant to be a songwriter. So I would bet it's a Perkins song. I'd say the same. I also don't believe that if it was written by M. Grant (probably the only time he'd have written something for Johnny), Cash would take that moment in the spotlight away from him and introduce it as a Perkins song. I hope that maybe Carl's autobiography (or both of them, as I think there was also one released in the 70s) has more info on why the credit lists Marshall Grant. The reason I ask is that I plan to add a chart to Wikipedia that lists Carl's hits as a songwriter. That side gets overlooked too many times imo and people mostly focus on him being something like a one-hit-wonder. Here are songs that were (co-)written by Carl and that became hits. It includes covers but also songs Carl himself didn't record. If you got some other records to add, feel free to do so. I didn't include Elvis' "Blue suede shoes" as that was only released on EP back in the 50s IIRC. Hey, does anybody know why my Wikipedia entry is gone? 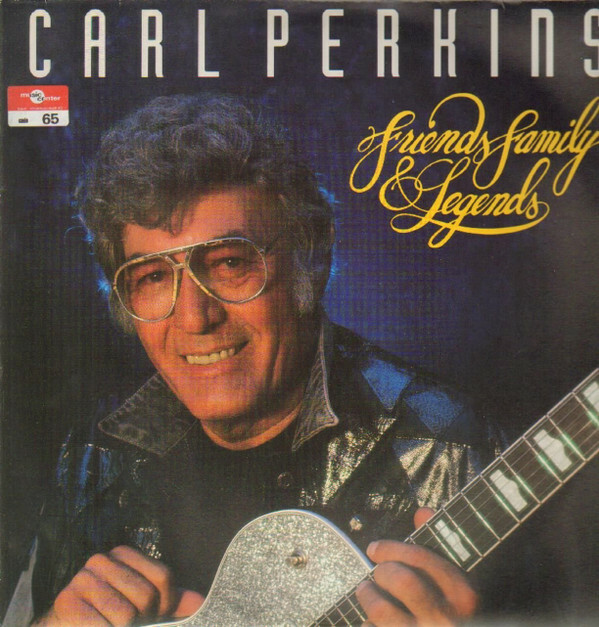 Bernie Hamburger was a musician who built custom guitars, and Carl Perkins was one of his clients. This is an informal public Q&A session with Bernie where he talks about Carl Perkins and George Harrison, and sheds a little more light on George's relationship with Carl...plus, the backstory of how Bernie's guitars ended up on the Beatles' "Anthology" reunion tracks and how they occupied a special place in George's home even after he passed away. It was Carl Perkins responsible for those guitars getting to George. Also, some rather sad info I had not remembered about George planning a world tour...but by the time preparations were made he became too ill to do it. Still, the video is a little sad, because it reminds me of how little Carl is known today. On another note: Why did they take my Wikipedia-updates down? 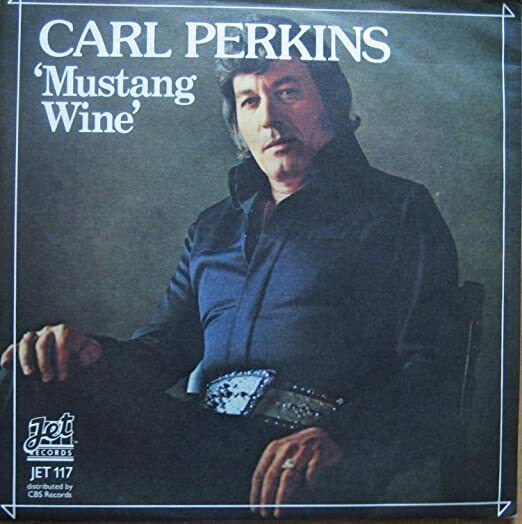 Ok, here's my review of what certainly is one of the very best "archive"-releases by Carl Perkins. Make sure to check out the sound samples on the above link. After Carl toured years as part of the Johnny Cash show and along the way wrote the hits "Long legged guitar pickin' man" and "Daddy sang bass" for Johnny, Carl went back on his own touring with his sons Greg and Stan. In 1978 he signed with Jet Records and recorded an album called "Ol' Blue Suede's back" that features his interpretations of classic Rock'n'Roll songs from the 50s (plus one new composition, "Rock on around the world", which would later be rewritten as "Birth of Rock'n'Roll"), matching the nostalgia craze at that time. 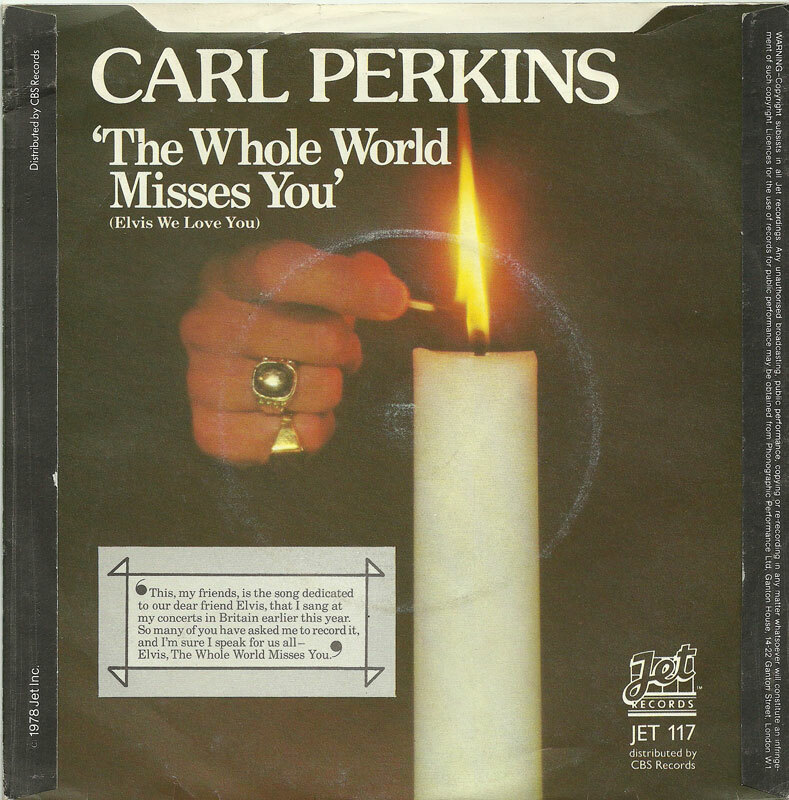 Jet Records put a lot of promotion behind the album and it turned out to be Carl's best (and only) charting album in the UK. A follow up album with original material was not released in it's original form. Producer was Felton Jarvis who of course was Elvis Presley's personal producer until the King's death the year before. Musicians included David Briggs and Mike Leech, while Carl's guitar was of course everywhere to be found. To get an idea of the sound, just imagine something like Elvis' Jungle Room recordings but without the orchestra overdubs and more rocking and in your face. Don't let the oldie-concept shadow your opinion, these are real performances of those songs not just covers. Some work better ("That's allright", "Rock around the clock") some not ("Whole lotta shakin' goin' on") but it's a fun listen through and through. Here's an article from that time. Check out that young Tom Petty. A lot of promotion was done for the album and Carl did a lot of appearances in the UK. One was on BBC Radion. The second disc of this set features a detailed 45 mins.-interview with Charlie Gillett, followed by an on-fire-performance by Carl with a band that featured Dave Edmunds. These couple of recordings are some of the best stuff of Perkins you will find, and that is saying a lot. If you know the '86 TV special, again featuring Edmunds but also Ringo Starr, Eric Clapton, George Harrison and Rosanne Cash, this one is even better. The highlight is "That's allright" which rips the whole place apart. As Carl noted at the end "That's Rock'n'Roll, right there". Now, as mentioned, there was a second album recorded with the same musicians and Jarvis as producer. That probably led to the song "Let me on" being included which was supposed by Elvis to record in his planned early '77 Nashville sessions which didn't happen to take place. The song sounds like a bona fide hit of the times. It was later recorded by Jerry Lee Lewis in a imo nice but subpar version. A single was released of the song "Miss Misunderstood", written by David Bellamy and Carl played it in his live shows in the coming years. Other songs included "Why you been gone so long?" by Mickey Newbury and "Mustang wine" by Steve Earle as well as one of my favorite Perkins compositions, "The hurt put on by you" which he released later in a different version which you can hear if you click on this link. Carl's Elvis-tribute "The whole world misses you" was also featured as it was a favorite among his audiences around that time. The album was never released in it's intended form but the songs were scattered on different releases. This release now collects all on two CDs and what a great release it is. The liner notes are very detailled and give you more info than I did with my review. Make no mistake, Carl was back and rocking! Please give it a thought if you might wanna get this. It's not a hidden masterpiece, but a very good and solid effort in Perkins style- The BBC session on the other hand is a masterpiece. Now, this is a release that's very dear to me. First, find out more about the story of it's evolution and the recording on this link. You can listen to some samples if you click on the link above the album cover. Carl and Scotty Moore - Elvis' lead guitar player from '54 to '68 - go way back. Just when Elvis and Carl toured together during 1954/1955 and parts of 1956, Scotty and Carl also became friends. In 1975 Carl called Scotty, D. J. Fontana and the Jordanaires to back him up on his Elvis-tribute single E. P. Express (a re-recording is found on 706 ReUnion) backed with a re-recording of Carl's mid-60s song Big bad blues. The album's concept and it's title might make one think that this is just another of those awful and cheaply produced albums of re-recordings with subpar performances. Well, in this case one would be very wrong. The music tracks are interspersed with dialogues between Scotty and Carl and tell the story of how the album came to be in real time. That can get very corny, but not as creepy corny as us Beach Boys fans are treated with from time to time, but corny in a nice way; just two old guys having some fun. The main focus of course lies on the music performances. Instead of tired note-for-note re-recordings, we actually get some great performances and a couple of new songs as well in a laid-back style. The musicians are some of the best for this kind of music and recording, including D. J. Fontana, Marcus van Storey, Johnny Black (son of Bill Black) and Carl's sons, Geg and Stan. Both, "Night train to Memphis" and "Milkcow blues boogie" are played in mid-tempo and giving Perkins and Scotty enough room to show their guitar skills without taking up too much space. Carl is in strong voice, although he was just declared throatcancer-free after getting treatment. Two instrumentals, "Black eyed Suzie Brown" and "Windy & warm", put the distinctive guitar styles of both center. For this album Carl wrote three new songs: "Damn Sam" (about Sam Phillips and the working atmosphere at Sun Records - co-written by Scotty), "The worst of her" (co-written by Stan and Greg Perkins as well as D. J. Fontana) and the funky "Pickup truck". Recorded at the old Memphis Recording Service at 706 Union Avenue in Memphis, Tennesse (the Sun Studio), the sound is very much alive. Eventually released on Scotty Moore's Belle Meade label, this may not be a commercial blockbuster project (it's much too laid back for that, anyway), but it definitely is everything but a cheaply produced, lackluster run through some old favorites. Everyone involved cared about the project and music and you can clearly hear this. It used to be available through Scotty's website but I don't know if that is still the case. If you can get a copy of this album, I'd advise you to get it. It's one of those albums that I can't help but grab my guitar and try to play along. Powered by SMF 1.1.21 | SMF © 2015, Simple Machines Page created in 0.258 seconds with 21 queries.